Asalto Montalvo is a large-scale participatory video projection over the façade of Montalvo’s historic Villa. Art Work by Daniel Canogar; Artistic engineering by Diego Mellado Martinez. Asalto, which means "storming of ..." in Spanish, unfolds in two sequential phases: First, participants are invited to crawl along a horizontal green screen parallel to the ground as if they were climbing up a wall. Then, this filmed action is projected on the Villa’s façade. As the night progresses, images of clambering bodies accumulate, layering on top of one another until eventually the façade of the Villa is immersed by a collection of active human forms. Asalto collapses the demarcation between spectator and participant. It also responds to the specific conditions of the place in which it unfolds. Each iteration engages distinct publics and structures, including a Baroque church in Rome and an abandoned factory in Greenpoint, Brooklyn. Asalto Montalvo premieres on the historic Villa on July 20, 2012 at 7:30 pm. The projection will begin with a dance performance by Jeannine Charles/ArtistEDGE featuring a newly composed instrumental piece by Charles with a classical uplifting tone inspired by Canogar’s project. The dance performance will be followed by public participation. Asalto is a public-participation art piece which, rather than repeating itself from one venue to another, changes with each presentation. It does this by getting local participants to contribute to the making of the art piece. Volunteers are asked to crawl along a green-screen surface placed on the floor while an overhead camera tapes their actions. I direct their performance, although I am also very keen to have the participants contribute their own ideas with whimsical gestures and unexpected movements: some of the best footage has been obtained by incorporating suggestions from others in the past. The final piece emerges as a shared creation that implicates the participants in the art making process. In the past Asalto has been projected on a 13th Century castle in Spain; a 19th Century aqueduct in Rio de Janeiro, the façade of a baroque church in Rome and an abandoned factory in Greenpoint, Brooklyn. Though each venue has given Asalto a different flavor, what remains consistent is my desire to have citizens project themselves, literally and metaphorically, onto their immediate environments. More than ever we need to counter banal, alienating and sometimes threatening public spaces with more playful, creative and enlightening experiences of our immediate surroundings. As a Spanish artist, I have been greatly influenced by the history of Spanish painting, and more specifically by the baroque frescoes painted directly onto the surfaces of public and private architecture. Asalto should be thought of as a contemporary fresco in which pixels have replaced painting ─ the video image has become a pervasive artistic tool in contemporary art. Asalto is also part of a long-standing interest in weightlessness, and how gravity profoundly affects our bodily experience. 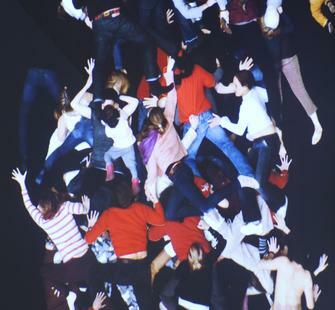 Participants initially feel the weight of gravity when crawling along the green-screen surface, followed by a sense of liberation when witnessing themselves climbing vertically up the surface of the wall. Asalto invites us to bring out our inner King Kong, and imagine ourselves conquering all those obstacles we inevitably encounter in our lives.